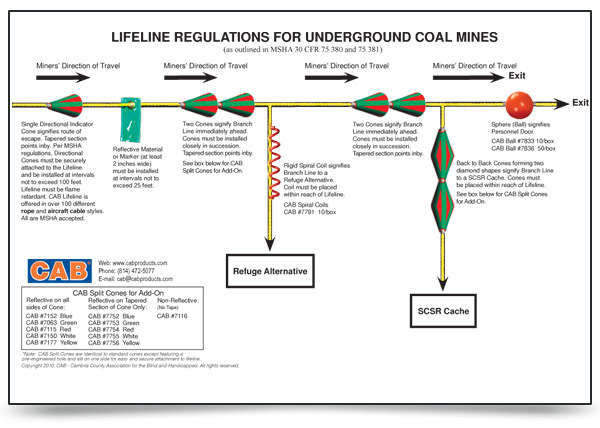 CAB Lifeline is an emergency escape line designed to help evacuate an underground mine in the event of fire or explosion. Since 1985, the CAB Lifeline has been hand crafted to rigid standards of quality and performance. It is available in rope and heavy-duty aircraft cable styles to meet the wide variety of requirements found in the underground mining industry. CAB Lifeline meets all state and federal regulations and is accepted by MSHA under Part 18, Title 30 Code of Federal Regulations. Research by NIOSH and the U.S. Bureau of Mines confirms that use of Lifeline can significantly improve chances for successful escape when fire breaks out in an underground mine. CAB Extra High Visibility Lifeline is easily seen from any direction in escapeways. Lifeline markers hang vertically so they can be seen for long distances up and down escapeways. Markers are flexible so miners’ hands can slide easily over them. Single cone signifies route of escape. Hand slides smoothly over tapered end of cone when exiting mine. Hand encounters blunt end of cone heading inby. First in Durability, Visibility and Safety Features. CAB Lifeline is hand crafted to rigid quality standards. Available in rope and heavy duty aircraft cable styles. Lifeline sections quickly and securely lock together with heavy duty aircraft cable oval sleeves, thimbles and quick links. 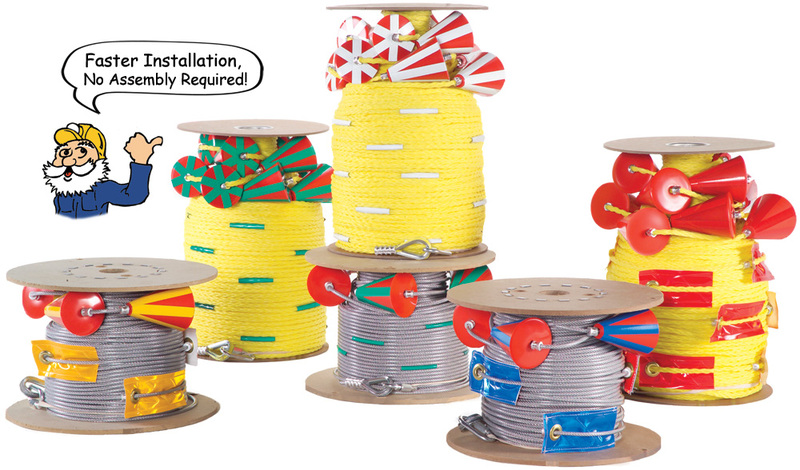 CAB Rope Lifeline is manufactured from 1/4″ (6.4mm) diameter, yellow, flame retardant polypropylene rope. Available in 300′ (91.4m) and 1,000′ (304.8m) spools. CAB Heavy-Duty Aircraft Cable Lifeline (patent pending) is much more durable, especially in case of mine fires, explosions or rock falls. Made from strong 3/16” (5mm) diameter plastic coated, galvanized aircraft cable for maximum durability and safety. Sold in 300′ (91.4m) spools. CAB Extra High Visibility Lifeline features the most brilliant reflective markers in the industry. 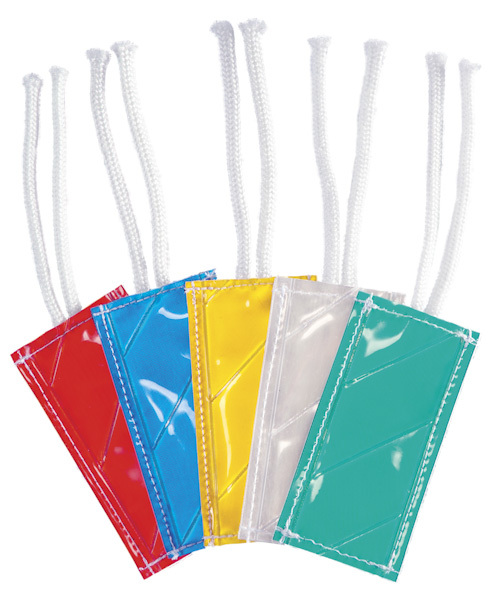 Markers are firmly attached to Lifeline and can’t break or fall off like other reflectors. CAB Lifeline is offered in standard and extra-high visibility styles. CAB Standard Lifeline has 2” (51mm) wide reflective tape bands wrapped around the Lifeline at 25 foot (7.6m) intervals between cones. CAB Extra High Visibility Lifeline meets heightened safety standards with reflective markers suspended vertically at 25 foot (7.6m) intervals between cones, as pictured above. CAB’s brilliant extra high visibility markers can be easily seen from any direction in the escapeway. Because of their firm attachment to the Lifeline with aluminum stop sleeves, these reflectors stay oriented to show proper direction of escape at all times. CAB’s flexible retroreflective vinyl markers are the most brilliant on the market. They are sturdy and won’t crack, shatter or fall off the Lifeline as hard plastic reflectors do. Available in 2″ x 4″ (51mm x 102mm) size as pictured above or in double length 2″ x 8″ (51mm x 203mm). Can be reflective on one or both sides in the same or different colors. CAB Directional Cones have 6 reflective bands for high visibility. All cones are securely fastened to Lifeline with aircraft cable hardware. Cannot be accidentally dislodged or removed. Reflective bands available on entire surface or tapered surface only. CAB Directional Indicators are molded in large, heavy-duty solid cones. The cone size and shape is specifically designed to quickly identify proper direction of travel and to prevent a handgrip from being broken when in actual use. CAB Lifeline is hand constructed under rigid quality control by feeding Lifeline through the center of all cones. Cones are then firmly attached to the Lifeline with aircraft cable hardware. This construction prevents directional cones from being dislodged, tampered with or removed from the Lifeline. 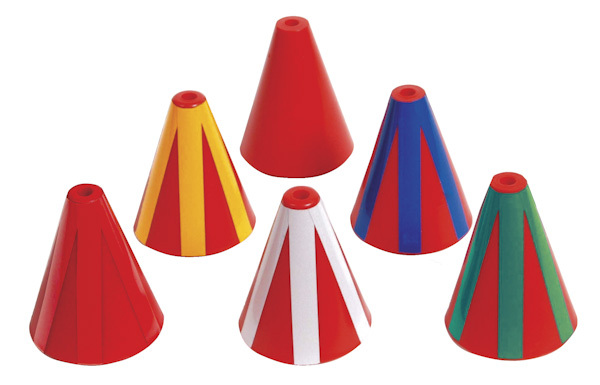 Other lifelines on the market use small cones that make it hard to tell proper direction of travel or cones that easily unsnap and fall off, even in normal use. CAB Split Cones are identical to standard cones except featuring a pre-engineered hole and slit on one side for easy and secure attachment to previously installed Lifeline. Use two cones on main Lifeline to mark all branch lines. Use four cones, forming two diamond shapes on branch lines, to indicate SCSR storage caches. Sold in kits of 10 cones and 20 stop sleeves. Two cones signify branch line ahead, four cones signify SCSR storage cache ahead. CAB Lifeline Balls are used for marking location of mine personnel doors. Solid and durable, yet lightweight. Firm, secure attachment features a pre-engineered hole and slit on one side for quick, easy installation. Sold in kits of 10 balls and 20 stop sleeves. Single ball or sphere signifies personnel door. CAB Spiral Coil Rumble Strips are used on branch lines that lead to refuge alternative. 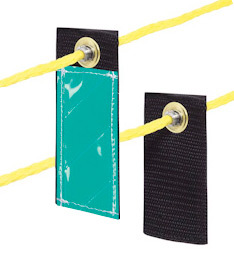 Strips measure 2″ x 8″ (51mm x 203mm) and are easily threaded into strands of existing Rope Lifeline or can be attached with cable ties to Aircraft Cable or Rope Lifeline. Two cones signify branch line ahead; spiral coil signifies refuge alternative ahead. 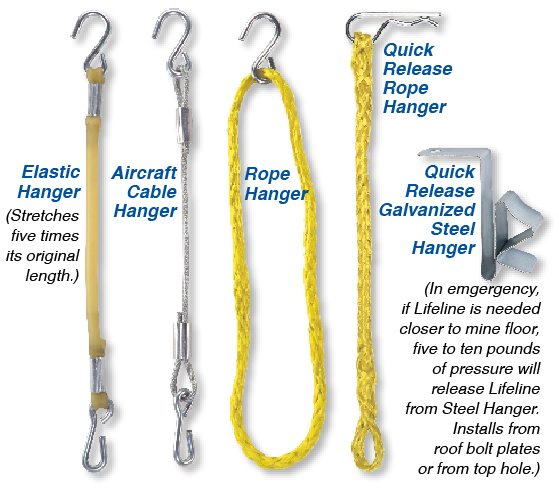 Rope and Aircraft Cable Hangers quickly attach to lifeline and have a strong hook for attachment to plates, mesh or roof structure. Elastic hangers are especially useful in crosscuts; they stretch five times their original length to lower lifeline during use and return it to original height after use. Quick-Release Hangers have a release pin that attaches to hanger hole or edge of plate. They can be quickly pulled off plates to drop lifeline for emergency escape. Elastic hangers can stretch 5 times their original length to lower Lifeline during use. 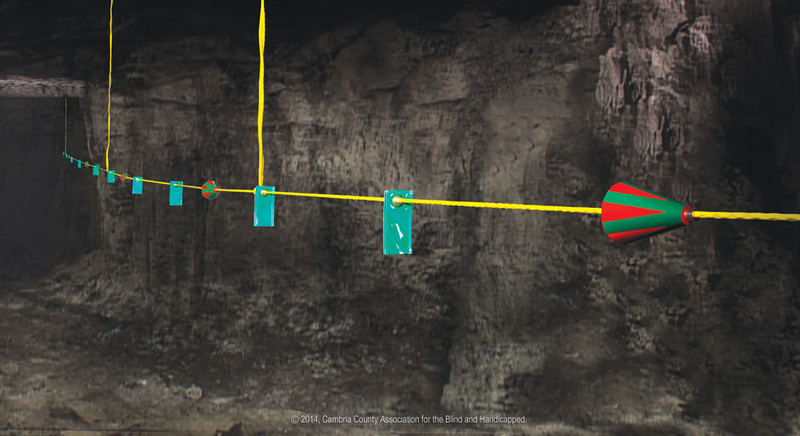 CAB Lifeline with interchangeable Velcro Markers is designed for mines that change color of Lifeline after longwall operations. Made from strong polypropylene webbing with velcro on one side. High visibility 2″ x 6″ (51mm x 152mm) reflective markers with velcro backer (sold separately) are quick and easy to attach and change later to another color as mining progresses and escape routes change. CAB Tie-On Markers can be easily added to existing Lifeline. Made from 2″ x 4″ (51mm x 102mm) brilliant retroreflective vinyl. Stitched on all sides. Strong nylon cord is sewn into top hem for securely tying markers to Lifeline. CAB Lifeline requires no assembly and is ready to install. All parts are integral and securely attached with aircraft cable hardware. Lower in overall cost compared to other brands that require stocking of parts and extra labor for assembly. Click for CAB Lifeline Aircraft Cable MSHA acceptance letter. Click for CAB Lifeline Rope MSHA acceptance letter. Full size posters (24 inch x 40 inch) are available free of charge for your mine safety training program. Click here and complete contact form to request your complimentary poster(s). For smaller posters (8.5 x 14 inch legal size ) which you can download and print, click on poster image above.